Where else other than Vancouver do you get a tree-topped buildings, sunny beaches, and snow-capped mountains? to arrive to Tinhorn Winery in the Okanagan Valley! Potentially, some of the information in this article may have been obtained during a press trip funded by a Canadian tourism board, either the Richmond or Okanagan tourism boards, in particular. It's nice to know that Vancouver British Columbia has several wineries nearby, and you can drive just a few minutes and go wine tasting. Most the wineries are located in Fraser Valley, although you can also visit the Gulf Islands and Victoria Island wine regions, and they offer a selection of grape and other fruit wines. At Lulu Island Winery, I tried my first fruit wines, and, though, to my palate, they did not have the complexity of grape wines, they were quite interesting. In particular, Lulu Island Winery makes a passion-fruit wine that would be fascinating to taste alongside Thai curry. Located on Westminster Highway in the Richmond neighborhood of Vancouver, Lulu Island Winery offers daily tastings of five wines for free, and you can book a VIP tour and tasting for $10 (our wonderful guide, Corinne Toutoux, said to keep an eye on Groupon and other sites for deals). In addition to sampling a nice 2010 Viognier, 2011 Cabernet Franc, and 2011 Meritage, I got to learn about winemaking in the Richmond neighborhood and the Richmond neighborhood's history. For example, Richmond used to be called Lulu Island, and many of the winery's grapes come from the Okanagan Valley—a great wine region that we'll be visiting in the next post. I also learned about Canadian wine laws, which have been a hot subject of debate as of late. Our guide Corinne said that, until recently, it was difficult to bring wine from one Canadian province to another with incurring a hefty tax. It seems that she and other wine folk are happy to have this levy lifted, and Corinne pointed out that it helps wineries in different parts of Canada to work more closely together. Unfortunately, the Canadian government still puts a heavy tax on its wines, and you might be able to find Canadian wines for a lower price in the United States, where the wines are not so taxed. It's a bizarre situation. Another bizarre fact that I learned later: In the Richmond neighborhood, a business can only call itself a winery if it has grapes growing onsite: this means that wineries that source their grapes elsewhere still have to grow token vineyards just to market themselves as wineries. While we're talking legalese, I might as well give you the low down on buying wine in Canada and bringing it back to the U.S. While Canadian taxes are higher, the wines still come at a good price, and United States customs typically taxes you about 21cents a bottle to bring it back to the U.S. Make sure to declare your wine, because U.S. customs tends to check—plus, they rarely make you pay any tax if you're bringing back less than 24 bottles of wine. In terms of price, most wines in British Columbia tend to cost over $20, but they come at a high value. I've tasted some very nice white and red wines with great acidity that cost between $20-$40 and should go for $30-$60. Canadian wines are still under the radar, and they're worthy much more, I promise. Which means only one thing: Get thee to Canadia! 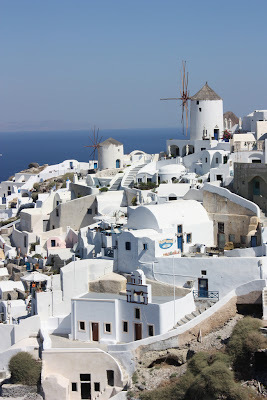 This article originally appeared on the Viator travel website. Sandwiched between some of Europe’s most seductive culinary cultures, Croatia has fascinated epicurean travelers with surprisingly great food and wine since gaining independence in 1996. 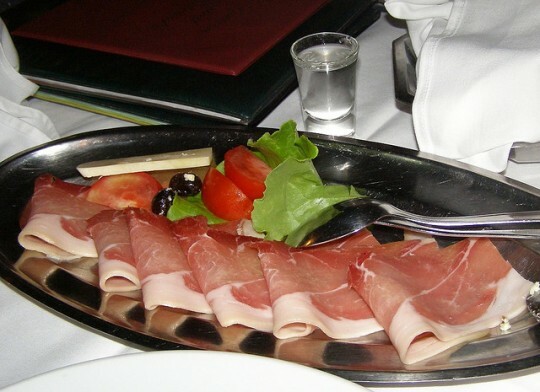 Some areas of Croatia were part of Italy until the end of WWII, and you’ll find gnocchi, pastas, and olive oil-based dishes on one hand and, on the other, paprika, yoghurt, spicy grilled meats, and other icons of the Near East. This melting pot of delicious foods has induced everyone from backpackers to Anthony Bourdain to enjoy fresh mussels and local wine on Croatia’s pebble beaches. A visit to Blue Canoe Waterfront Restaurant in the Steveston neighborhood of Vancouver, British Columbia. This article is part of the one-month road trip series, The Great Northwest North American Wine Road Trip, during which we'll visit wine countries in Oregon, British Columbia, and Washington. Follow along in real time on Twitter with the hashtag #NWRoadTrip. Ah, the press trip: so misunderstood. One of the toughest parts about press trips, as a journalist, is judging the authenticity of your experiences. Due to simple logistics, many of the wineries, restaurants, hotels, and other businesses that you visit have had a long time to prepare for your arrival. Sometimes, this is just practical: The winery should make sure that a knowledgeable representative is available during the visit to answer our, often tedious and complicated, questions. Other times, the business pulls out all the stops, and it can be pretty painful to watch a hardworking waiter or concierge bend over backward to provide a “special” experience (I should also point out that I worked as a waiter for nine years, I have lots of good chef buddies, and I still work in wineries from time to time). But if there’s one thing I’ve learned over my six or so years of culinary travel writing, it’s that you cannot fake hospitality. This was beyond evident at Blue Canoe Waterfront Restaurant in Steveston, Vancouver. Bonnie, our waitress, made us feel instantly at home; chef Danilo Ibarra became a fast friend; and manager Rob maintained a professional yet familial cordiality while giving us an honest and expert assessment of the British Columbia wine scene. For me, hospitality is one of the most important things on earth; I learned it from my Irish relatives and the Italians who welcomed me into their homes throughout Italy. At its core, hospitality is about making others feel truly at home, and it usually involves copious amounts of food and wine. Blue Canoe is located in Steveston, a small working waterfront in the Richmond neighborhood of Vancouver. Often overlooked by travelers, Steveston has a great little boardwalk, and the plethora of fisherfolk ensures fresher-than-fresh seafood, including Vancouver’s delicious specialty, spot prawns (when in season). Richmond, Vancouver, is one of the only places on earth where spot prawns are found, and Blue Canoe specializes in seafood. Chef Danilo Ibarra utilizes a Nicaraguan heritage, French training, and British Columbia’s excellent produce to create darn unique dishes. Located on a small pier, Blue Canoe restaurant has killer views of the Fraser River. Grab a seat on the glassed-in patio and order a couple signature cocktails. Canadians love their Caesars, which are more or less a Bloody Mary made with clamato juice. I went for the Sweet Mojave Rain, which combined Hypnotiq, tequila, pinot gris, fresh lime juice, and simple syrup. If you’re visiting between late April and mid-June, ask whether spot prawns are in season, and if they are, order them immediately. Danilo specializes in inventing distinctive preparations for the day’s freshest seafood. Overall, Blue Canoe offers competitive prices. Our incredibly innovative plates of halibut, trout, and sablefish were each around $30; other entrees ranged between $14 and $40; and cocktails were $7. The wine list was quite expensive, which is typical in Canada, where liquor taxes are exorbitant. Blue Canoe serves a range of dishes, some of which draw inspiration from Danilo's Nicaraguan upbringing; offerings include ceviche, sirloin with quinoa, burgers, and paella. We began with the spot prawns, which came with a honeydew, cantaloupe, and mint salsa and a cucumber slaw. There’s no wrong way to eat a spot prawn, so roll up your sleeves and dig in (the wait staff will hook up warm water with lemon and a whole nother round of napkins afterward). Spot prawns are a bit richer than typical prawns—I found them closer to lobster than shrimp. Danilo had gone out with "Fisherman Frank" Keitsch of Organic Ocean to catch the spot prawns that morning (famed local blogger Lindsay Anderson of 365 Days of Dining was also on the boat, where [lucky fishermen!] Danilo made ceviche with the day’s catch on the spot). 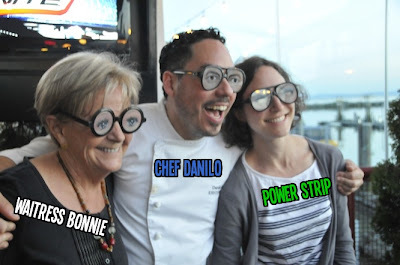 Next, Bonnie and Danilo directed us toward the other fresh seafood: the halibut, trout, and sablefish. The halibut arrived atop house-made herb gnocchi, finished with a prawn cognac sauce. The trout, prepared with a walnut tarragon brown-butter sauce, was accompanied by purple potatoes, and the pan-seared sablefish came with rice pilaf and an orange-ginger soya-miso glaze. Every dish was wildly different. Miss Kristin, aka Power Strip; Marcy Gordon, aka Sicko; and myself, aka Dim Sum, couldn't keep our hands off each other’s plates. Sicko’s was super buttery, with a crispy seer; Power Strip’s was topped with caramelized walnuts; and my gnocchi were extraordinarily light (Danilo uses the rule of 2x2x2: 2 lbs potatoes, 2 eggs, and 2 cups of flour). To go with it all, Bonnie recommended a fantastic pinot gris produced by Pentage Winery in Okanagan. It had a peach-like hue and light, delicate flavors reminiscent of a fresh French rosé. Damn, it was good. For dessert, Danilo recommended his signature tres leches, which incorporated chocolate, coconut, whipped cream, caramel, a gooseberry, and a strawberry carved into a rose. It was perfect for sharing, and so good with a neat Crown Royal. All I could say was thank you. After lots of laughs with the Blue Canoe crew, Power Strip, Sicko, and Dim Sum headed out into the Steveston night, knowing that we’d eaten some of Vancouver’s best, and having made wonderful connections with people in an unfamiliar land. Portions of this article included information obtained during a press trip funded by the Richmond BC tourism board.